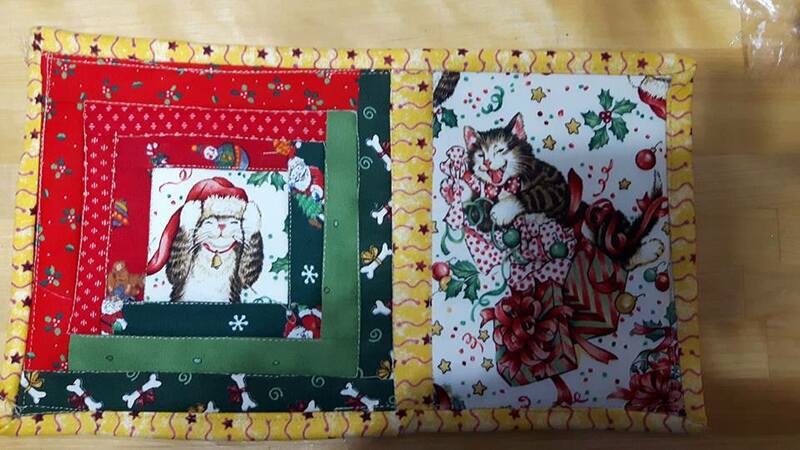 Todays blog is made especially for a friend that is just learning to quilt.. She wants me to do a tutorial on how to make a mug rug so that she can make Christmas gifts… She wants to work with rectangles.. I choose the log cabin block to for these. I designed this on my EQ 8 program. The finished size will be 5.5×9 inches. The fabric requirements for making 8 of these. Here are the strip cutting instructions for piecing the mug rug. We’ll start with the log cabins side block 1st. Sew your strips in a circular motion around the earth… and keep going till you have run out of your fabrics.. the block should end up 5.5 x 5.5 or close. Cut 1 inch strips of all your fabrics the longest piece you will need is 1″ x 6″ … the YouTube video shows how to sew them without sub cutting them to size… if you want to be precise than here are all the measurements. cut strip 1 x 3 red#1 and sew to cabin working around the block. the accent fabric divider is a 1″ strip sewn on the right of the log block. This fabric is also used for the binding. Then I choose to fussy cut the focal fabric so the cat would be centered. Before cutting this piece measure your log block and use that as your measurement mine was 5 1/2x 5 1/2″ so I cu the piece to 4″ x 5.5 high. When you sew this on be sure to watch the direction of your focal fabrics. Now all that is left is to sandwich with batting and back and to bind it with the accent fabric. A YouTube tutorial can be found at this link. Warm your cabin mug rug please take note that I did this as the easy way out with no measuring as you build your cabin block. Using sew and trim method. Please be patient with the video I don’t claim myself to be a professional this is just to help those who may want to learn how to do this… I strongly believe that there are many techniques out there and to take and keep what you want.